A new design dimension from CTD – Geometic Tiles .. 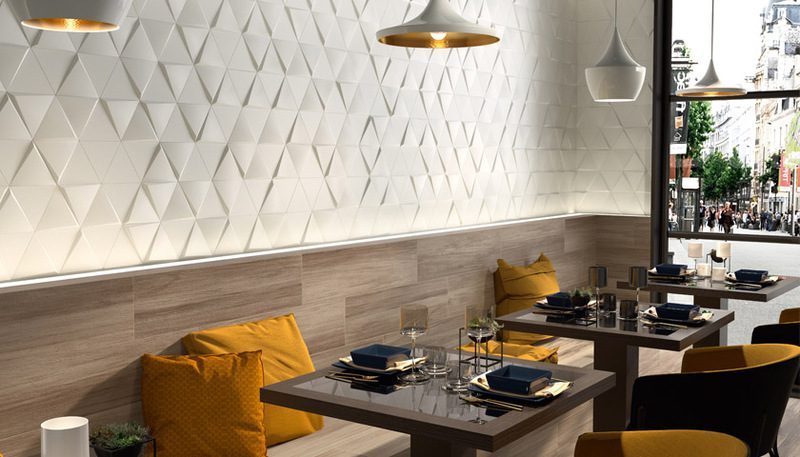 Bringing new meaning to geometric and 3D tile design, CTD Architectural Tiles has introduced two new ranges to its extensive product portfolio – Evoke and Metropolitain. Combining a multitude of shapes, finishes and sizes, the new glazed ceramic collections are guaranteed to create statement features within any manner of architectural or design space. Providing infinite decorative possibilities, the Evoke collection is comprised of two shapes, a triangle and a rhombus, in black and white. Available in a gloss or matt finish, the collection also offers wood, cement and metallic finishes, allowing designers to create unique three-dimensional features. Reminiscent of the original 20th century Parisian metro tiles, the Metropolitain glazed ceramic bevelled tiles provide a contemporary twist on a classic design. Combining a variety of colours, finishes, textures and fitting options, this collection will deliver a retro feel in an updated palette to create true standout style statements. To find out more about Geometric Tiles by CTD Architectural Tiles, please click here.